Catalina Ironwood is a tree locally native to the Channel Islands off of Southern California. Surprisingly hardy once established and older this spectacular evergreen tree in the rose family boasts amazing divided foliage with symmetrical scalloped serrations along each margin. Very pretty. 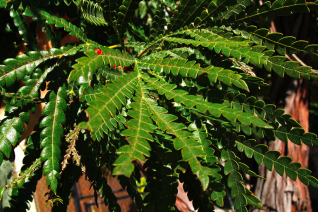 The glossy aromatic leaves are seen to great advantage against the straight, red exfoliating trunk. In spring flat umbels of white flowers appear all over the tree. Fast growing in youth to its ultimate size here 25’+ tall in 15 years. Requires a protected location- such as against the wall of a large building. Avoid direct exposure to subfreezing wind. Little water once established. Wonderful tree for courtyards- protected areas. Fantastic performance at the Oregon Coast. Protect young trees from temperatures below 15ºF- wrap or swaddle in burlap or remay until arctic weather has passed. Reaches its full hardiness several years in the ground. There is a wonderful mature specimen of this tree at the McMennamens in St. John in PDX and scattered large specimens occur around the city. Nice, nice urban tree.